Read on to find out more from Dr Jovina See in this article. Cataract is the most common age-related eye condition that requires surgery. Although cataracts can occur at all ages, it affects us most as we get older. By the time we reach our 50s, at least some early cataractous changes will usually be present in our lenses. Despite huge advances in the treatment of cataracts, many myths still surround this common eye condition, and cataract remains the number one cause of blindness in the world today. The lens in our eye consists of largely protein and water. As we age, metabolic changes of the crystalline lens fibres, including protein denaturation, cause a gradual loss in transparency of the lens. This results in a yellowish to brownish tint forming in our lens, which increases over time and progressively blocks light from reaching our retina, thereby clouding our vision. What Symptoms May We Notice? n the initial stages, we may notice our vision becoming slightly poorer under dim lighting. Our spectacles prescription which has been stable perhaps since our late teens to 20s may start to increase again. Colours may appear more washed out, although we may not notice this as cataracts often progress slowly and insidiously. Indeed, many patients are often amazed by how much more vibrant colours look after their cataracts have been removed by surgery. I remember one lady in her 40s who literally wept tears of joy on the night after her cataract surgery, when she saw how vivid the red and green colours on the television were. As our vision gets progressively blurrier, day-to-day activities like reading and driving become more difficult. Certain types of cataract give rise to increased glare in situations with bright light, such as on sunny days or at night when facing the headlights of oncoming vehicles while driving. 1. We get cataracts only in old age. Cataracts can affect any age group. While some congenital cataracts are detected at birth, others are detected in the early years of life. Traumatic cataracts can occur at any age and can develop within 24 hours, particularly with penetrating injuries of the eye, and even with blunt injuries. Recurrent ocular inflammations, chronic topical or oral steroid medications and radiation therapy can also give rise to cataracts at any age. Even age-related cataracts, though more common from the age of 50, can arise in younger patients who may only be in their late 30s to 40s. This occurs especially in patients who spend a lot of time outdoors and are exposed to prolonged UV light. My younger cataract patients are often golfers or sailors. 2. My vision is blurred, but the doctor says my cataract is not “ripe” enough for surgery. A common myth that exists today is that we should wait for our vision to be really poor (<6/12) and our cataract to ‘ripen’ before we seek surgical treatment. This myth exists because an older method of cataract surgery called extracapsular cataract extraction is sometimes performed. 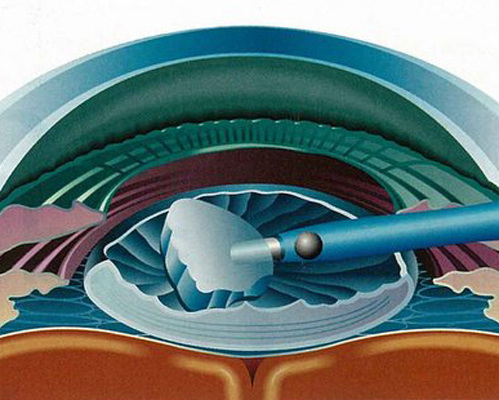 In this method of surgery, a large wound is made so that the entire cataract can be delivered through in one piece. About seven to 10 sutures are usually required to close such a large wound, resulting in postoperative astigmatism that can prevent the patient from seeing well in the first few months after their surgery, until sufficient wound healing has occurred to allow the suture tensions to be adjusted. With our increasing dependence on mobile phones, computers and driving these days, patients often find that they cannot tolerate even mild to moderate glare or blurring of vision, and thus end up feeling frustrated when told by their doctors that they should wait until their cataracts worsen further before considering surgery. With the advent of minimally invasive, small incision phacoemulsification surgery which became increasingly popular in the 1980 to 1990s, however, we now no longer have to wait until the cataract is ‘ripe’. In this method of cataract surgery, we use a handpiece with a tip that vibrates at an ultrasonic frequency of 40,000Hz to emulsify and fragment the cataract. The smaller fragmented pieces of the cataract are then aspirated from the eye, and an intraocular lens implant is injected into the eye. As the incision size can be kept under 2mm in length, no sutures are required to close the wound – hence, no postoperative astigmatism is induced and the patient enjoys restoration of vision right after the surgery. As a result, we are able to perform phacoemulsification surgery earlier when patients experience difficulties due to symptoms attributed to their cataracts, instead of having to wait until their cataracts are ‘ripe’. The design of intraocular lens implants used during cataract surgery has come a long way, especially in the last few decades. In 1949, Sir Harold Ridley in London was the first to successfully implant a lens in the eye. He chose an acrylic plastic material (polymethylmethacrylate or PMMA) for the lens implant. He noticed that this material remained inert in the eye, after observing Royal Air Force pilots in World War II with pieces of shattered canopies in their eyes. However, it was only in the 1970s that the intraocular lens implant finally gained widespread acceptance in cataract surgery, after further developments in lens design and cataract surgical techniques had taken place. From the 1970s until recently, only monofocal intraocular lens implants were available for use in cataract surgeries. In 2003, the Food and Drug Administration (FDA) in the United States approved a new category of intraocular lens implants – accommodative and multifocal lens implants. These implants were designed to enable the patient to enjoy both good distance and near vision, thereby addressing the issue of presbyopia and reducing the need for reading glasses. Since then, there have been advances in intraocular lens implant design, which include the square-edge design to reduce the incidence of postoperative posterior capsular opacity, aspheric design to counter the spherical aberrations of the eye, as well as non-glare edge design and blue light-filtering implants that filter UV and high-energy blue light present in natural and artificial light. Toric intraocular lens implants are now also available to enable patients with significant amounts of astigmatism to enjoy good spectacle-free vision. The latest advancement is the introduction of trifocal lens implants, which are designed to improve on the intermediate distance vision, in addition to providing the patient with good distance and near vision. For patients with extremely high myopia and astigmatism, an individually customised lens implant can even be ordered from the lens manufacturing company and made to specifications. With the availability of such a wide array of intraocular lens implant designs, counseling of patients by ophthalmologists thus becomes even more important in deciding the most appropriate choice of the intraocular lens to be implanted during surgery. Preoperative assessment of the patient’s lifestyles and needs, as well as careful evaluation of the suitability of the patient, is of utmost importance. Since 2001, femtosecond lasers have been used successfully in LASIK (Laser In-Situ Keratomileusis) refractive surgery. This laser replaces a blade that is used to create a corneal flap, so that a secondary laser ablation can be performed on the eye to correct for the patient’s refractive error. The femtosecond laser has thus contributed to more precise and safer outcomes in LASIK. The use of femtosecond laser in cataract surgery was first explored by Professor Zoltan Nagy in Budapest, Hungary, in 2008. This laser device was made available in Singapore since 2012. The objective was to use femtosecond laser instead of a blade to make the corneal incision in cataract surgery. The laser can also be used to create a round opening in the anterior lens capsule and to achieve a preliminary fragmentation of the lens nucleus, before proceeding with further fragmentation of the lens by the usual phacoemulsification method. As with any new technology, many studies are being carried out worldwide to evaluate its efficacy, safety and success outcomes. However, cost-effectiveness is still a major issue with this laser device. Huge advances in surgical technique as well as intraocular lens implant design in the last few decades have contributed to making cataract surgery today a safe and effective procedure, associated with rapid recovery of vision and little downtime. Majority of patients are able to resume their normal activities by the night of the surgery, and with appropriate choice of premium intraocular lens implants like multifocal and toric intraocular lens implants, patients can now look forward to greater spectacle independence.